Joe Bologna became a full-time sculptor after being a successful San Francisco Bay Area architect for thirty years. 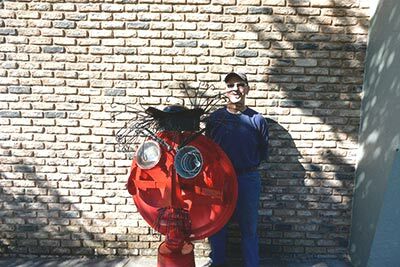 Joe’s sculptures have been enjoyed throughout the greater Bay Area, including Cloverdale. He enjoys working in metal and is the proud owner of a large scrape pile of metal. Looking through his pile of metal he sees not rusty, twisted metal, but eyeballs, animals and people. Joe takes pride in diverting materials from the landfill route, then combining them to create a bit of visual interest or to put a smile on viewers’ faces.